Most men I know have spent way too much time developing their signature. And why not(? ), it is their public "mark" for life. But it's not our fault, ladies, really. We are made in the image of God, and I think this is something we have inherited from our Father. Even having signatures that are difficult to make out is, I think, something given to us by God...why else? Let me explain. Have you ever wondered what Jesus meant when he said, "I am the Alpha and the Omega"? I think we have some idea that this is just another way of saying, "I am the first and the last, the beginning and the end." And that is correct, certainly, but He is really saying so much more. Jesus is saying, "I am the signature of God." As you are aware, most of the New Testament was originally written in the ancient Greek. However, Jesus spoke Aramaic. So, while John writes in Revelation, "I am the Alpha and the Omega," what Jesus would have said was, "I am the ALEPH and the TAV." Alpha is the first letter of the Greek alphabet, Omega is the last. The first letter of the Hebrew alphabet is the Aleph, the last is the Tav. But the essence of what Jesus meant is lost in translation. This phrase, "I am the Alpha and the Omega," first appears in Revelation 1:8 and last appears in Revelation 22:13. 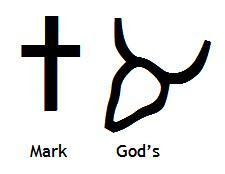 However, the depiction of Jesus as the Aleph and the Tav is first made in Genesis 1:1. When Jesus says to John before the grand revelation, "I am the Aleph and the Tav," He is, in fact, referencing the first sentence of the Bible, and, in the process, clarifying a mystery that has existed since the Torah was first written. Right in the middle is an untranslated word. In fact, it is untranslatable because it is not a word at all. It is simply the ALEPH and the TAV. Why? It seems very strange. This is a mystery to rabbis and mystics as well. Actually, it is to this ALEPH and TAV that Jesus was referring. Just as the book of Revelation begins and ends with Jesus saying, "I am the Alpha and the Omega," so too does the Bible. The Hebrew alphabet has 22 letters or characters. This is reflected in the 22 chapters of Revelation. "I am the Aleph and the Tav" is a clue to this parallel. That there are 22 letters in the Hebrew alphabet necessarily means that 22 letters are sufficient for what God needs to say, otherwise there would be more. When John writes, "In the beginning was the Word, and the Word was with God, and the Word was God. 2 He was in the beginning with God. 3 All things came into being through Him, and apart from Him nothing came into being that has come into being." John 1:1. Jesus as "the Word" is really Jesus as every word: the ALEPH and the TAV and everything in between (the whole Bible). In Hebrew, the first sentence in the Bible is comprised of seven words. Within those seven words, the ancient Hebrew pictographs tell the story of the entire Bible. The seven words needed to depict the entire Bible parallel the seven days needed for creation. I have shown this in part in prior posts: In the beginning, God (The Lord is My Shelpherd), created (On Creation), and "the heavens" (Oh, My Heavens! Part 1 and Part 2). I will develop "the heavens" further in later posts, as well as "the earth" to show the entire picture of Genesis 1:1. The first three words are all about Jesus (1) as Messiah, (2) as creator, and (3) as the shepherd. The last three words contain all of God's covenants, old and new. However, right in the middle is this untranslatable Aleph-Tav. Actually, this is the most important part. The ancient Hebrew pictograph for the letter Aleph is an ox head, meaning strength or God, as in "the Lord is my strength". The pictograph for the letter Tav is two crossed sticks, meaning a mark or covenant. Therefore, when Jesus says, "I am the Aleph and the Tav," what He is saying is that He is the MARK of GOD, or God's signature. When God has Moses write the Aleph and the Tav into Genesis 1:1, what God is saying is, "You see, this Jesus, He is the Messiah who is going to die on the cross for your salvation, He is the creator who was in the beginning, He is the shepherd prophesied about in the Old Testament. He is My Word, He is My Covenant, He is My Signature." In contract law, it is the signature of the person to be bound that is required. We have God's contract, and it is signed, sealed and delivered. What more could we ask for.